While it was a new day in the Big Brother 2014 house, it definitely felt like the same day from Monday! That is, until the evening rolled around and these HGs decided to tell Caleb the plan to get rid of Amber this week on Big Brother 16 and he has lost it. I don’t know if this is good or bad, as we have two days in that Big Brother 2014 house and you never know what might happen! Check out the highlights below in our Big Brother 2014 spoilers! To be honest, the day could have been on repeat and no one would have known. It was another day of Caleb being delusional and both him and Amber thinking she is staying and he deserves more from her and all he has done for her and blah blah. To the good stuff (if I can even keep it together). There was a lot of action that happened and it all revolves around telling Caleb the plan or blindsiding him on Thursday night with the eviction of Amber. They think a blindside could make him come after him (we would hope), so of course they eventually told him (and made Zach do it). Prior to this, there was talk of keeping Amber around and sending Jocasta home this week. They are worried about numbers and the other side of the house ganging up and coming after them, which they don’t seem to figure out themselves. Derrick eventually nixes the idea because Amber is not to be trusted. There literally was a lot of back and forth and people talking and Hayden and Cody talk about Christine and how they can’t trust her. Then people can’t trust Frankie and Nicole is paranoid about Frankie throwing her under the bus with Amber and her saying that Amber approached her for an all-girl alliance. We also saw Cody and Zach talk for a while and it seems like they may have worked out their differences and are talking some major game with each other. They don’t trust Christine or Frankie and it looks like they know all the drama happening is because of rumors from the two of them. Frankie always throws Zach under the bus any chance he can get because he knows Zach will always have a bigger target on his back. If only Zach could calm it down for a little while! 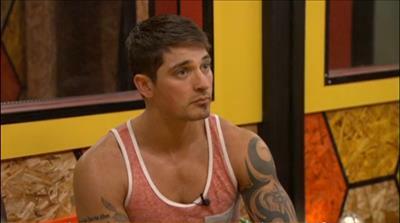 But that does not happen, as they decide to tell Caleb about Amber going home. However, they have it come across as Amber is now targeting Caleb (which she did mention earlier because he is ruining her game). Zach tells him and Caleb freaks out! He goes and gives her the death stare and doesn’t talk for a long time (and even flung her rabbit slippers he was wearing across the living room)! He did all this for her and she wants to target him? He is nuts and now seems to want her gone, but this went late into the morning and we’ll keep you updated….these HGs on Big Brother 2014 never go to bed! For start Caleb is a nut case and he needs to go next. When will Zack wake up and see they are using him. Something needs to happen to wake that bunch up. Oh wait they don’t never sleep. I wish the underdogs would form an alliance and start getting rid of the guys. Can we go in and just smack em around. Maybe that would help. Hahahaha if he only knew what the outside world is saying about him. The dude is a walking time bomb. I’ve wondered about that, if they read all the comments when they are out of the house. I doubt it very much but hey, it’s worth a try, I’m game! hahaha!!! OK Caleb is a 20 watt bulb in a world of flood lights. Physically strong but mentally weak is no way to go through life. OMG Jon never heard that one before. Love it. He is a walking nut case. I would never ever date a controlling freak like him. I think we will see quite the show Thursday. Yesterday Caleb talked about how he bawled when he did his goodbye message to Amber (the ones they show when a hg gets evicted). Later, after learning Amber was not loyal to him, he went to the diary room and asked if he could redo it. He also asked if he could take 30 seconds of the live show (before the eviction) to put her on blast and tell her she’s going home. He said they would get back to him on that one. But i suspect BB would LOVE all the drama it would cause. Last night he went into “freak” mode again. Wearing that stupid crown on his head, along with Frankies “onesie” and Ambers bunny slippers. So now he knows she will be voted out Thursday. And his obsession has turned from love to hate. Oh there are lots of names for him. Hope he does not do anything to crazy. Nutcase. Yea I love it. Lets see, frosted flakes, fruit loop, can we go on. I’m kind of disappointed that Derrick would fuel Calebs obsession by encouraging him to put Amber on blast during the live show. He even told him what he should say. Of course at that point Amber would be safe from any further Caleb wrath since she would be leaving the house. But i think these guys have pushed Calebs buttons enough. He doesn’t need their help now in over the top behavior. Leave it alone and let it play out as it will. I suspect today we will see a sulky Caleb with anger festering inside him. But if he gets even one minute alone with Amber the tides could turn again. Worth watching the feeds to day to see if he can keep his mouth shut…..oh what am i saying….that will never happen. I agree Cat. They all know he is a walking time bomb about to explode anytime. Why add fuel to the fire. He needs professional help. Don’t BB see this when they are interviewing the HG prior to the show. I think he wanted on BB to find a women. When she is gone he wont want to be in the BB house anymore. We will see or he may use that anger and start winning. Yeah, I think it is lame and pathetic to fuel his fire any more. They have what they wanted, so why make it even worse? I like Derrick, but then he does things like this and other things that make me want to root against him! I’m watching my Dvr’d BBAD from last night and these HG are terrible to Caleb behind his back. 🙁 As much as I don’t like him, it’s awful that they are laughing at his expense and plotting to fuel his delusions. I guess you don’t know how it would really be unless you are actually in the house with them with absolutely nothing better to do… but still i’m not impressed by their behavior. Caleb is a walking contradiction. Yesterday i almost had a little respect for him but he ruined it. He was talking to Zach about how hard his Mother worked. And all he wanted to do was to be able to hand her a big enough check so that she wouldn’t have to work so hard. She deserved to rest. He even shed a couple of tears as he was saying this. And i thought to myself what a nice thing to want to do for your Mother. But then he went on to say that his Mother drove some big expensive car, had just about anything she wanted and was lucky to have boys that were so successful. Not only that but him and his brothers were the best looking guys in their town. And the most famous. You see what i mean? He has a heart somewhere beneath all that ego but bragging and delusions keep it hidden well. I go back and forth with myself about wishing that he gets help or hoping that he gets brought down a peg or two. Either way i wish the other hgs would back off on their mental manipulations of this guy. That is enough to make me sick. Yes he is up and down like a yoyo. I am sure his mother wont be proud how he went in the BB house and got so obsessive with a women and ruin his game. I’m sure he is VERY hard to live with and it is extremely easy to fall into the bullying that the HG’s are all doing together. I can’t say I wouldn’t fall into it myself. Caleb represents to me, a type of person that I’ve had issues with in my past and it’s so hard not to want to teach him a lesson. But the man truly needs a doctor. I’m sure that most of the things he brags about are only to help him make up for something he’s lacking. Usually when someone has to talk about themselves that much it’s only because they are trying to convince the world they’re great…or trying to convince himself he’s great. Been there….done that too Kesha. I waited with baited breath for someone to get their come-uppance. And once they did it was extremely unsatisfying. I learned there was a vast difference in praying that someone gets a reality check and praying that someone gets HELP in order to face reality. It’s human nature to pray for the first one, but a compassionate human that prays for the 2nd. After the live show, can someone watch the live feeds during the live show. What I am getting at is, it would be fun to see what actually happens during the commercials, especially tomorrow night. I bet BB will be watching Caleb very closely. I believe you can. I usually watch the show on my computer and have the live feeds up at the same time. But i view the live feeds on another source while doing that (not CBS). I get better quality of the feeds from my other source than CBS. But after the show i switch back to CBS usually. Hay everyone today is our Mary’s birthday. Thank you, I had a good one! 23 again….that’s what I tell everyone…my Dr. asked me my age and I said what year is it? Not even close hahaha! But that’s just fine with me, I love getting older and hey, it’s better than the alternative. Happy Birthday Mary….hope you have a great day! Thank you! It’s been great and the good times continue! What a great site this is. Everyone on here is like a little BB family. We are all so lucky, thanks Todd. No problem and Happy Birthday, Mary!!! And many more! Happy Birthday Mary! Hope it’s great and you are in excellent health and good spirits! May you get all you desire and have a blessed year! Love your cat Kesha. How cute. I miss my cat and dogs…they were all smarter than someone in BB house…I won’t mention any names. Thanks so much lady, it’s been just great! Yesterday the houseguests were discussing the cables (wires) that were installed while they were on lockdown. You suppose this indicates an endurance comp? Donny said there were 11 of them but there will be only 10 competing in the next HOH comp. I expected an endurance last week but we didn’t get it. It does tend to make one wonder though what those cables might be used for. Has anyone in the house or BB THOUGHT about Amber’s safety. All the lies could cause problems for her while inside the house with the STALKER. All the time Ferro. Never seen you here before, welcome everyone here is awesome. Caleb is very dangerous. I don’t know that they have started the BB jury house yet or not. Cat or Todd do you know. Not yet. After Ambers eviction the jury should start. Assuming they have a 9 person jury this year. Absolutely, as Carol said, all the time. Im still on the fence as to whether or not Caleb is “Dangerous”. He is a crazy person who has mood swings but he hasnt shown that he is dangerous to anyone but himself…unless I missed something. It will be better for Amber to get out now before being stuck in the jury house alone with Caleb. Ambers family is selling “Team Amber” t-shirts to raise money for cancer research. They plan on donating the money in honor of Frankies Grandfather and Ambers step-father. She seems like a sweet girl. To bad Caleb ruined her game with his obsession. Well not only him but mostly. Now that is awesome. I would buy one. Have a good day all.